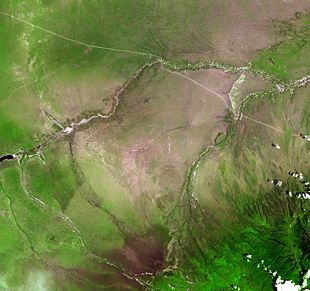 Olduvai Gorge or Oldupai Gorge is located at the border of the Ngorongoro conservation area and the Serengeti National Park in Tanzania. It is a steep-sided ravine in the Great Rift Valley. This world-famous paleoanthropological site was studied for more than 40 years by Louis Leakey and his family. The 30-mile (40 kilometer) long ravine yielded numerous fossil remains from pliocene to pleistocene times (from about five million to 10,000 years ago), including the skull of the primitive hominid australopithecus boisei (or "nutcracker man") and homo habilis ("the human who used tools”). The site has also produced remains of stone tools, animal bones, and other early hominid remains. The fossilized footprints, showing pre-human hominids walking in a upright position, found by Mary Leakey at nearby Laetoli, is considered one of the greatest paleoanthropological discoveries of the twentieth century. Based on findings at Olduvai Gorge, and other findings in Tanzania, scientists concluded that modern humans made their first appearance in East Africa. 'Olduvai Gorge is a steep-sided ravine in the Great Rift Valley in the eastern Serengeti Plains in northern Tanzania. The gorge is named after the Maasai word for the wild sisal plant Sansevieria ehrenbergii, commonly called Oldupaai. Often referred to as the "Cradle of Mankind," the gorge is one of the most important prehistoric sites in the world and has been instrumental in furthering understanding of early human evolution. Excavation work there was pioneered by Louis Leakey in the 1950s and continued by his family. Millions of years ago the site was that of a large lake, the shores of which were covered with successive deposits of volcanic ash. Around 500,000 years ago, seismic activity diverted a nearby stream which began to cut down into the sediments, revealing seven main layers in the walls of the gorge. The stratigraphy is extremely deep and layers of volcanic ashes and stones allow radiometric dating of the embedded artifacts, mostly through potassium-argon dating. 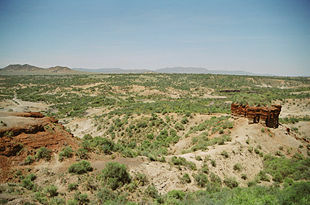 The main Olduvai Beds are in a lake basin about 16 miles (25 kilometers) in diameter. The rocks under the basin date to 5.3 million years ago. The first artifacts in Olduvai (pebble tools and choppers) date to approximately two million years ago, but fossil remains of human ancestors have been found from as long as 2.5 million years ago. Exposed deposits show rich fossil fauna, many hominid remains and items belonging to the one of the oldest stone tool technologies, called Olduwan. The Olduvai Gorge bears the distinction of having the oldest known evidence of mammoth consumption, attributed to Homo erectus around 1.8 million years ago. Seven major Beds have been distinguished, ranked from oldest to youngest: Bed I, Bed II, Bed III, Bed IV, the "Masek Beds," the "Ndutu Beds," and "Naisiusiu Beds." Bed I dates to 2,100,000 years old and is 197 feet thick. It is mainly formed of lava flows, volcanic-ash deposits and other sediments. The upper part of the bed contains varied fauna and evidence of the Olduwan industry. Bones from this layer are not of modern humans but primitive hominid forms of Australopithecus boisei and the first specimens of Homo habilis discovered by Louis and Mary Leakey, establishing that modern humans first appeared in Africa not Asia as previously believed. This Bed has produced evidence of campsites and living floors along with flint tools. The debris found at the sites includes various Olduwan tools, bone, and teeth from animals, mainly from fair sized antelopes. Also, a loosely built circle of lava blocks was found, suggesting the formation of crude shelters. Above this, in Bed II, pebble tools begin to be replaced by more sophisticated hand axes of the Abbevillian industry, made by Homo erectus. This layer dates to around 1.5 million years ago. Bed II is 66-98 feet thick and is 1,150,000 to 1,700,000 years old. It has two main divisions of rock layer—upper and lower—that were separated by an erosional break. The lower part of Bed II is similar to Bed I. The upper part was formed after fault shifts had reduced the ancient lake's size. It is in this part of Bed II that the development of the Acheulian industry starts to show. Here also were found the remains of Homo habilis, Homo erectus and Australopithecus boisei. The gorge was modified by fault shifting and erosion, after which Beds III and IV were created. These two Beds range from 1,150,000 to 600,000 years ago, and have produced Acheulean tools and fossil bones of Homo erectus. Beds above these are termed the "Masek Beds" (600,000 to 400,000 years ago), the "Ndutu Beds" (400,000 to 32,000 years ago), and the "Naisiusiu Beds" (22,000 to 15,000 years ago). The Masek Beds accumulated during a period of major faulting and volcanism roughly 400,000 to 600,000 years ago. There is only one major archaeological site in these Beds, with findings from the Acheulian tool industry. The Ndutu Beds were formed by faulting, erosion, and the filling of the gorge around 32,000 years ago. In these Beds, two sites have been found which date to the Middle Stone Age. The last of the archaeological Beds is the Naisiusiu, which lies in the bottom of the Gorge at what is now the present depth. It contains one site that has microlithic tools and one complete Homo Sapiens skeleton, both of which date to 17,000 years ago. Less than 30 miles (45 kilometers) to the south of Olduvai Gorge, in Laetoli, is the site where Mary Leakey discovered a fossilized trail of footprints dating back 3.7 million years. This discovery, evidence of very early hominids walking upright on two feet without any use of hands, necessitated changes in theories regarding the evolution of bipedalism. Located on the rim of the Gorge is the Olduvai Gorge Museum, which presents exhibitions pertaining to the Gorge's history. 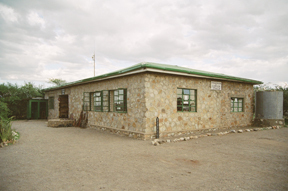 The Olduvai Gorge Museum is located in the Ngorongoro Conservation Area in Northern Tanzania on the edge of Olduvai Gorge, directly where the Gorge splits into two. The museum was founded by Mary Leakey in the late 1970s, and was originally designed to house paleoanthropological artifacts from the surrounding area. After her death, the museum was put under control of the Tanzanian Government's Department of Cultural Antiquities. During the mid-1990s, The J. Paul Getty Museum's Department of Conservation renovated and added to the museum. This included a new wing with exhibitions that were designed by the J. Paul Getty Museum. 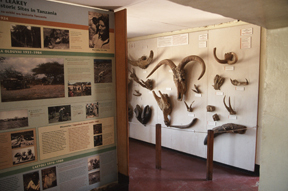 The museum has one hall dedicated to the Leakey family and their work at Olduvai Gorge. This hall has historical artifacts from the Olduvai Gorge area, as well as charts and maps explaining the process of fossil excavation. Many of the artifacts are original but some are casts (specifically the hominid skulls). The adjacent hall is dedicated solely to the Laetoli fossilized footprints. A cast that was made of part of the footprint trail in 1996 by the J. Paul Getty Museum is on display. Accompanying this are several charts and photographs describing and illustrating the process of the Laetoli Footprints creation. There is also a large illustration depicting three Australopithecus afarensis walking through the area 3.6 million years ago. In addition to these indoor museum exhibits there are also two outdoor lecture areas, which are utilized for an orientation presentation given by museum staff. The staff mainly consists of members of the local Maasai tribe, who are housed in what was once the Leakeys' camp. During peak season, the museum receives around 150 visitors per day who on safari in the Ngorongoro Conservation Area. Leakey, L. S. B. 1960. Adams Ancestors, The Evolution of Man and His Culture. New York: Harper & Row Publishers. Leakey, L. S. B. 1974. By the Evidence, Memoirs 1932-1951. New York: Harcourt Brace Jovanovich, Inc.
Pickering, R. 1968. 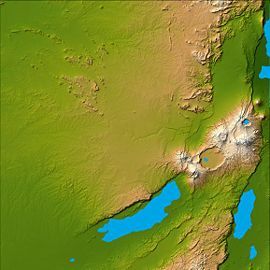 Ngorongoro’s Geological History. This page was last modified on 19 December 2018, at 16:26.